The average gift for a lost baby tooth in 2013 was $3.50, up $1.08 from the prior year. The average gift for a lost baby tooth last year was $3.50, up $1.08 from the prior year, according to The Original Tooth Fairy Poll®. More than 40% of the time, the lost-tooth gift was $1. Introduce the Tooth Fairy early on. Kids will start losing baby teeth around age 6. Before this age, parents can teach kids about the Tooth Fairy and let them know that good oral health habits and healthy teeth make her happy. Use this as an opportunity to brush up on a child’s everyday dental routine. Kids not wanting to brush and floss? Remind them that the Tooth Fairy is only looking for healthy baby teeth, not teeth with cavities. This will help get kids excited about taking care of their teeth. Leave a note reinforcing good habits. A personalized note from the Tooth Fairy could be nearly as exciting for kids as the gift itself. Parents should include tips for important oral health habits that the Tooth Fairy wants kids to practice, such as brushing twice a day, flossing once a day and visiting the dentist twice a year. And, of course, parents should give the Tooth Fairy a special name. Give oral health gifts. Although the Tooth Fairy left cash for kids in 99% of homes she visited, a few children received toys, gum or other gifts. Consider forgoing cash and reinforce good oral health habits by providing a new toothbrush with their favorite cartoon character or fun-flavored toothpaste. How about a new book? There are several children’s books about Tooth Fairy adventures that can add to the Tooth Fairy excitement. Also gone are the days of worrying about not being able to find the tiny tooth under your child’s pillow in the middle of the night. Special Tooth Fairy pillows with tiny, tooth-sized pockets attached are now available in many themes and can even be customized with your child’s name. But if the family tradition has always included money, you don’t have to stop. Consider giving both cash and a new toothbrush to reinforce good oral health habits. The Tooth Fairy is a great way to tap into your child’s imagination to help him or her understand the importance of oral health and to help make taking care of teeth more exciting. 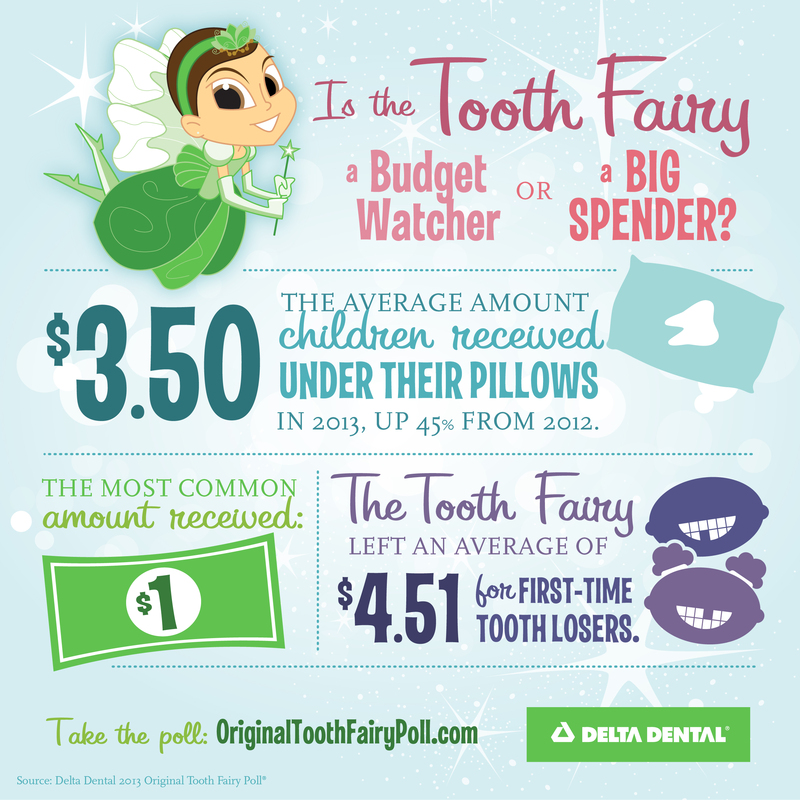 For more information and ways to make your child’s Tooth Fairy experience extra special, visit the Original Tooth Fairy Poll website.